Miniature UV datalogger for long-time monitoring of moving goods, people or animals, additional sensors can be used e.g. temperature, pressure, rel. humidity, illuminance (VIS) 2.000.000 data records. A sensor with characteristics specific to the application, e.g. UV broadband, UVA, UVB, UVC, erythema or v(lambda), and PC software are included. The UVMINILOG is designed for logging of ultraviolet radiation. Sophisticated microcontroller technology and low noise SiC based UV detectors allow up to 18 months of permanent measurement and logging without battery charging. Applications are dose monitoring of UV sensitive goods such as artworks or compound materials. Other fields include dose monitoring of UV hardening systems or sun UV (e.g. Erythema or UVA or UVB) monitoring of people, animals or plants. The unit can be mounted with a straps or screws. 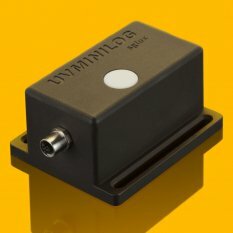 Since UV logging has applications in a wide range of industrial and scientific fields, the UVMINILOG is available with different detectors (one or two) measuring e.g. UVA, UVB or UVC only, UV-broadband, UV-Erythema or UV-ICNIRP. Different available sensors allow adjustment of the UV-sensitivity of the UVMINILOG from the nW/cm2 region for very low UV intensities (e.g. in museums) up to some W/cm2 radiation, which occurs e.g. in the UV curing industry. A NIST traceable calibration is included in the price.